Vitamin D deficiency is now a problem on a vast scale. 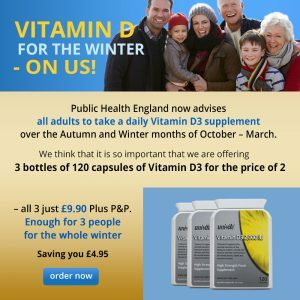 Which is why Public Health England recommends that everyone should take a vitamin D supplement in the winter months. People nowadays simply do not get enough sun exposure to achieve an optimum level of vitamin D. Not only is low vitamin D status a risk factor for many diseases, including heart disease, depression and cancer, but vitamin D deficiency can make many diseases more severe. Joint, bone or back pain – there is a relationship between lower back pain and low vitamin D status. Vitamin D plays a crucial role in calcium absorption and bone metabolism. Getting older. As you age, your kidneys are less able to convert vitamin D to its active form, D3 or calcitriol, which can lead to a deficiency. Leading scientists in the field have now established that the optimum level of vitamin D3 is a lot higher than previously thought. Yet solving a vitamin D deficiency is really simple. Y ou can buy Vitamin D3 (the preferred form of natural Vitamin D) from here. Our special offer is for 1 bottle of 120 capsules of 2,000IU D3 free when you buy 2. Dr Paul Clayton designed NutriShield as a comprehensive health supplement with OPTIMUM levels of essential nutrients including Vitamin D. See more detail elsewhere on this site or click on the button. Influence of vitamin D status and vitamin D3 supplementation on genome wide expression of white blood cells: a randomized double-blind clinical trial. Hossein-nezhad A, Spira A, Holick MF. PLoS One. 2013;8(3):e58725. doi: 10.1371/journal.pone.0058725. Epub 2013 Mar 20. Vitamin D deficiency and depression in adults: systematic review and meta-analysis.Anglin RE, Samaan Z, Walter SD, McDonald SD. Br J Psychiatry. 2013 Feb;202:100-7. doi: 10.1192/bjp.bp.111.106666. The secrets of happiness Should you take Vit K if you supplement with Vit D?